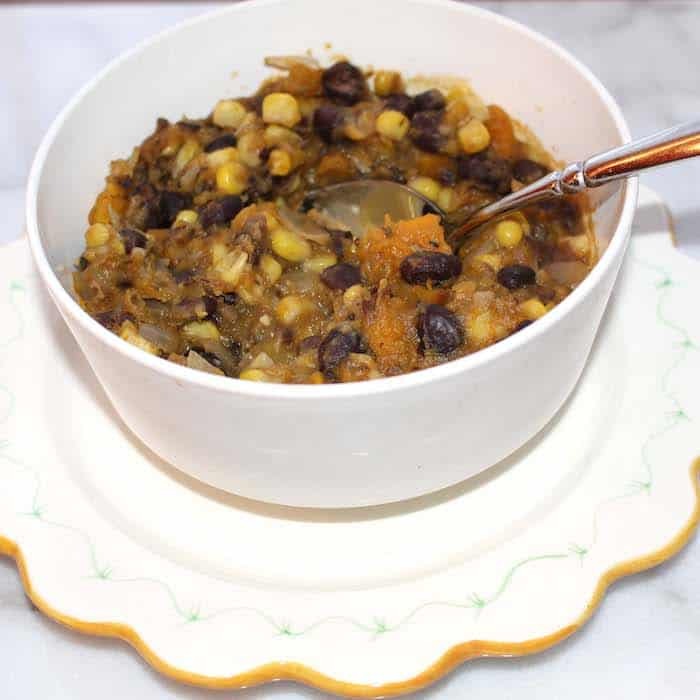 Chilean Bean Corn Stew. Spicy. Vegan. Amazing. A wonderful combination of ingredients makes this filling and so scrumptious. 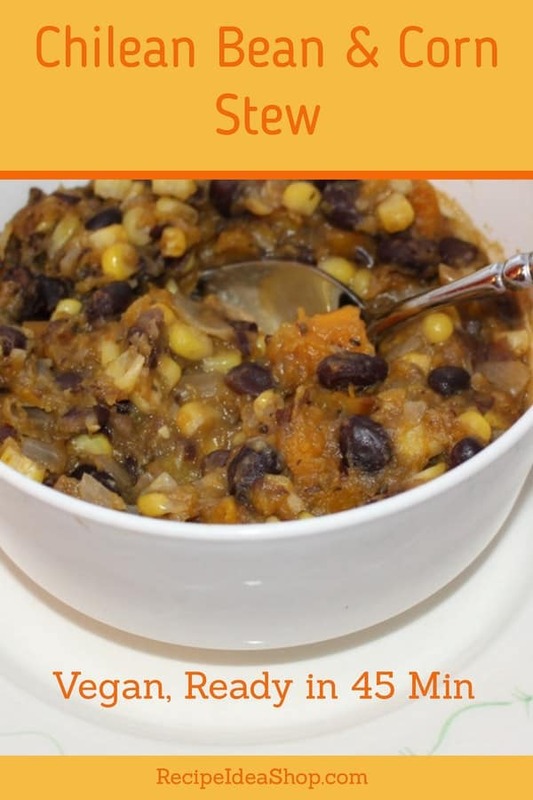 Chilean Bean and Corn Stew. One of my favorites. Hi. It’s Lois in the kitchen at Recipe Idea Shop, telling you about a superior Chilean Bean Corn Stew I love. It is one of my favorite vegetarian recipes. My husband Don has Type O blood; I have Type A. According to Eat Right for Your Blood Type by Dr. Peter D’Adamo, Don should be a meat eater and I should be vegetarian. We compromise and eat a few meals a week with meat, a few vegetarian meals and the rest with fish. Yesterday, Don was in Richmond all day for meeting so I made some vegetarian stew and went to a friend’s house for an evening of food and fellowship. I started with a recipe from the Moosewood Restaurant New Classics cookbook and made a few changes. I generally substitute black beans for kidney beans, pinto beans and most white beans. 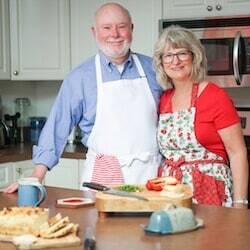 Moosewood recipes are always delicious. 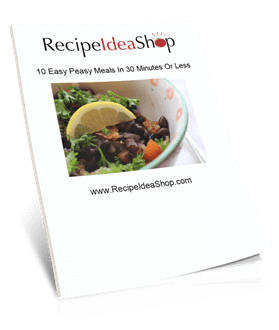 This stew freezes well, so make some now to eat and save some for another day. This recipe calls for transferring some of the soup to a blender or food processor. That can be messy. I highly recommend you get an Immersion Blender and use it instead. KOIOS 4 in 1 Immersion Hand Blender Powerful 800 Watt 12-Speed Includes Chopper, Whisk, BPA Free Mixing Beaker, for Soups, Smoothie, Baby Food – Stainless Steel. Buy it on Amazon today. In a large Dutch oven or soup pot, heat the oil over medium heat. Add the onions, garlic and spices and cook until the onions are translucent (about 10 minutes). Add the water and the squash and bring to a boil. Stir in the beans, basil and one cup of corn. Cover and simmer for 5 more minutes, or until the squash is tender. Ladle 2 cups of broth into a blender or food processor. Add the remaining corn and puree until smooth. Stir this mixture back into the stew and heat for 5 minutes until hot. Serve with a nice, crusty bread and a green salad. Alternate ingredients: Instead of black beans, you can use pinto beans. I have also substituted sweet potato for the butternut squash and it is delicious. 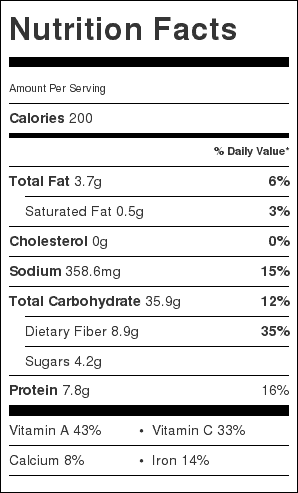 Chilean Bean and Corn Stew Nutrition Label. Each serving is about 1/2 cup.